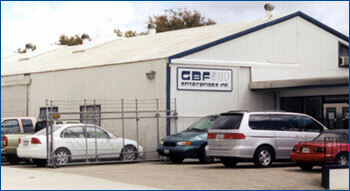 We are conveniently located near the 55 freeway between the 5 and the 405 in Orange County. (See map right). If coming from the north, take the 5 south to the 55 towards Costa Mesa, and get off at Dyer Rd. East. Turn left at the end of the offramp and proceed two stoplights to Halladay St. Turn right on Halladay St. and we are the third building on the right. If you are coming from the south, take either the 5 and go towards Costa Mesa on the 55, or take the 405 and take the 55 towards Riverside getting off at Dyer Rd. from either direction. Go west two blocks to Halladay St. and follow the directions above.